A married couple purchase a ramshackled home in New England, allegedly historical due to Washington having spent a night there. A surly neighbor owns a Fawn Great Dane that keeps the owners from using a private road to their home. A canine pilot from the dogstar, Sirius, checks out Earth to see if the rumor is true - Did dogs fail to take over the planet like they were ordered to? Towards the end of the movie a crop earred Blue Great Dane, who is the ultimate leader of Sirius, arrives. NOTE: Even though The Greater Dane is said to be a female, "she" was portrayed by a male named Valentino; Brana's New Era. A chauvinistic womanizer is murdered and comes back to earth as a woman (Debbie Reynolds). 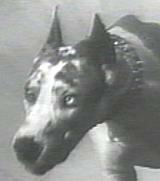 Near the end of the film, the woman is killed and comes back as a Harlequin Great Dane. This epic comedy stars Tony Curtis as the Great Leslie, a turn of the century daredevil, and Jack Lemmon as Professor Fate, his nemesis. 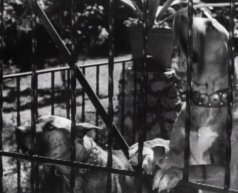 Professor Fate's house and laboratory are protected by 3 Great Danes seen in a short sequence when a female reporter (Natalie Wood) sneaks onto the property. People race across the country in an illegal, no-holds barred race. A Harlequin Great Dane is seen briefly. A romantic comedy of a girl who finds "Mr. Right" (Jim) but then begins to think he may be a killer. Jim walks a neighbor's Fawn Great Dane which causes a meeting of the young couple. The Dane seems overly forward towards human females. 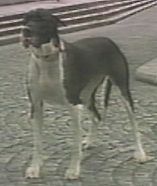 In one scene a Great Dane rig (plush/prop) is used in stunt work. A leading lady tricks a chorus boy (Bob Hope) into believing she is in love with him in a plot to help catch a killer. 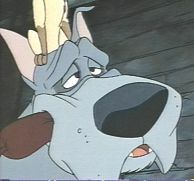 The leading lady's pet, seen in several scenes, is a Merle Great Dane. Arguably the best of the Dean Martin & Jerry Lewis film comedies, as well as their last. Using a fake raffle ticket, Steve (Martin) stakes a claim to Malcolm's (Lewis) prize - a new car. To keep from exposing the scam, Steve agrees to drive to Hollywood so Malcolm can meet his dream star, Anita Ekberg. Malcolm brings along his Fawn Great Dane. While on the trip, Mr. Bascomb sings, drives the car and more. This may be the best movie ever for Dane lovers. A portion of the trailer for this film can be seen in the movie, Grease, during the drive in scene. Dark comedy about a girl (Drew Barrymore) who becomes pregnant by a married man and soon has troubles with his family. What appears to be a natural ear Fawn Dane mix is owned by one of the man's stepsons and seen in several scenes. Basil Rathbone's first appearance as Sir Arthur Conan Doyle's Sherlock Holmes. The story has Holmes investigating a family curse - a curse that promises death by the jaws of a hound from hell! 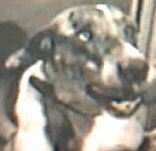 Holmes exposes the plot as a hoax created by a villian who is using a Great Dane as the devil dog. It is reported that the Dane's name was "Chief". This color Hammer horror features Peter Cushing as Sherlock Holmes. The story, based on Sir Arthur Conan Doyle's novel, has Holmes investigating a family curse a curse that promises death by the jaws of a hound from hell! Holmes exposes the plot as a hoax created by a villian who is using a 'masked' brindle Great Dane as the devil dog. TV movie based on Sir Arthur Conan Doyle's novel. This one stars Ian Richardson as Sherlock Holmes investigating a family curse that promises death by the jaws of a hound from hell! 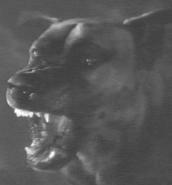 The villian is using a natural earred Black Great Dane as the devil dog. The classic Sir Arthur Conan Doyle novel adapted for the BBC. It stars Jeremy Brett as Sherlock Holmes. The tale has Holmes investigating a family curse that promises death by the jaws of a hound from hell! The villian is using a Great Dane as the devil dog. In this version the Dane is a natural ear fawn. For close up shots a black 'cropped earred' puppet/plush is used which can be seen clearly especially when viewing frame by frame. Sean Penn starts a dog walking business, and one of the dogs he walks is a fawn Great Dane. Boris Karloff is a scientist seeking a meteor. He has a Great Dane in his home. Bela Lugosi joines Karloff on the search. 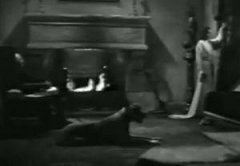 Once Karloff discovers the meteor is radioactive, the Dane appears in a key scene. This star-studded Cinerama comedy has a sequence near the end where Spencer Tracey falls into a pet store window. While in the pet store, he is licked by a Fawn Great Dane. A poor girl (Joan Fontaine) becomes governess in a mysterious household ruled by a ruthless master (Orson Welles). 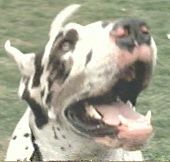 A Harlequin Great Dane appears at the introduction of Welle's character and in a few other scenes. Based on the novel by Charlotte Bronte. The comic "Bluntman & Chronic" are based on real-life stoners who aren't going to profit from a movie adaptation so they set out to go to Hollywood to wreck the filming of the movie. This movie features a short Scooby spoof featuring a familiar group of kids in a colorful van and a talking Great Dane. When hypochondriac Joe learns that he is dying, he accepts an offer to throw himself into a volcano. A Brindle Great Dane is seen briefly as a walk through. Based on Sir Walter Scott's "The Taliman". 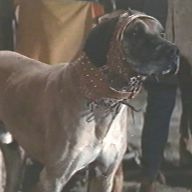 In an early scene, a Fawn Great Dane wearing neck armor with artificial 'natural' ears jumps up on his master's shoulders as comments are made about loyalty of men versus dogs. 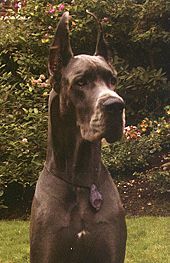 A Great Dane belongs to a beautiful woman (Annamaria Frances). 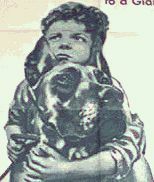 When the woman has a child, the Dane feels neglected and runs off, making friends with a young boy (Silvano Orlando). The woman finds the Dane and Jeeter must decide between his old home and his new young friend. 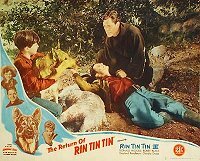 This Italian feature, produced in 1956, was released in the U.S. in 1961 as BIG JEETER by Citation Films and as BIG DOG LOST in Canada. Betty Hutton is a vaudeville star trying to gain custody of her daughter from her great grand mother who disapproves of vaudeville. 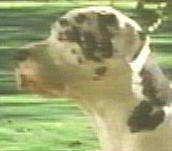 A fawn Great Dane lives with grandma and is involved in a cute escape scene early in the film. Fred Astaire also stars. A young actress discovers she is the daughter of a famous actor. The actor (Adolphe Menjou) has gotten a new pet, a brindle Great Dane. When Fauntleroy's father dies he is sent to America to live with his grandfather much to his mother's distress. This version of the classic tale stars Freddie Bartholomew as Fauntleroy. Greg (Elvis Presley), a professional photographer, meets an odd lady who likes her men as trained as Albert, her Great Dane. Albert is also portrayed in a dream as a talking costume character. 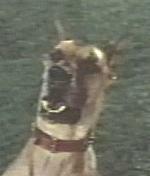 This Great Dane, named Baron, is the same dog who plays Rufus in DR. DOLITTLE (1967). This short is from the "Speaking of Animals" series. The series featured live action footage of animals with animated mouths allowing the animals to talk. 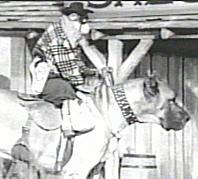 In this entry, monkeys perform a western satire. The hero, the Lone Stranger, rides a fawn Great Dane. Based on the comic strip by Brad Anderson. 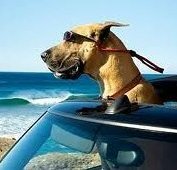 The movie follows the Great Dane and his family as they move from the country to trendy Orange County. Unlike the comic strip, Marmaduke, and the other animals talk. A single mother is surprised when her father shows up after having deserted her years ago. He brings a suitcase full of money and proceeds to buy gifts for her and her son. One gift is a large Fawn Great Dane. Crude comedy about a man with a split personality. In a brief scene a female Fawn Great Dane is having a bowel movement on a front yard. It has been reported that the Fawn is Creekside's Turkish Delight owned by Jan Brungard. A wealthy matron has a tendency to take in homeless men, much to the distress of her wacky family. The family owns two Danes, one natural ear Fawn and one cropped Brindle. Roger Bradley (Donald O'Connor) isn't permitted to work for his dad's big milk company because when stressed he quacks like a duck. So he gets a job with his father's arch-rival milk company & promptly falls in love with the boss' daughter who has a Fawn Great Dane. Cary Grant and Myrna Loy star in this comedy (later colorized) about a city couple who decide to buy and refurbish a country home. In a daydream sequence, Grant imagines going hunting with a Fawn Great Dane seen briefly. Boris Karloff portrays the famous Chinese detective James Wong in this mystery about a murdered Princess. 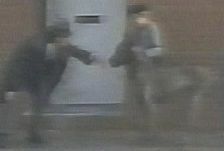 One suspect, a prominent banker, has two Brindle Great Danes guarding his home. This short is from the "Speaking of Animals" series. The series featured live action footage of animals with animated mouths so they talk. In this entry The St Louis Zoo chimps go through their acts (balancing, riding ponies, etc.). 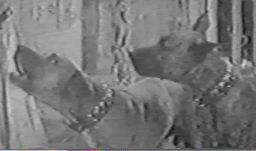 For one scene, the chimps perform in front of three dogs. Two of them are Harlequin Great Danes. This film tells the story of a writer (Elliott Gould) who also works as a professional dog walker. 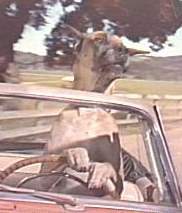 A Fawn Great Dane is seen in a still from the movie. Johnny Depp plays a book dealer looking for a book written by Satan who becomes entangled in a satanic plot. In one scene, Depp is confronted by a menacing looking natural eared mantle Great Dane. The Dane seems to be watching Depp. WC Fields tries to sell a movie script about a man (Fields) who falls out of a plane and lands on an estate at the top of a mountain in the Andes. There he meets a rich widow (Margaret Dumont) who has a strange pet - a Great Dane with fangs! Brian Donlevy plays gambler/burgler Daniel Shayne. Shayne breaks into a house just as the owner is murdered. The widow and Shayne must evade the police and Nazi spies (who did the killing). Based on the book of the same name by Philip MacDonald. Disney animated re-telling of Oliver Twist with animals. In this version, (human) Fagin's gang of pickpockets are a pack of dogs. Oliver is a homeless cat that joins them. One member of the gang is Einstein, a Great Dane who loves "a story with food in it". He is voiced by Richard Mulligan. A woman discovers her boyfriend is married, and has another girl friend. The three women team up to seek revenge on the guy. One of the ladies owns a Harlequin Great Dane. Jack Lemmon and his wife have a disastrous trip to New York. Forced to sleep in Central Park, they have their breakfast stolen by a Harlequin Great Dane. Folks living on a tourist island are terrorized by a pack of wild dogs created by canines left behind by tourists. A Great Dane is one of "the pack". Two Great Danes, a Mantle & a Black, are found by the patriots. Mel Gibson's character attempts to utilize the dogs as a way of winning favor. 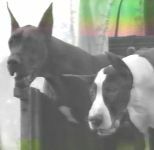 The Danes trained by Eadie McMillan of Gentle Jungle for the roles were Charity (a rescue Dane owned by S. Thommarson in California), Jake (Lady Black Diamond of Ruby, bred by W. & E. Garrison in Wisconsin) and Vanilla Fudge (a Harlequin bred by L&M Danes converted to a Mantle via make-up). A boy is given a school assignment to "change the world". His idea is to pay back a favor "before" it is owed by doing good deeds. When a reporter's car is totaled a gentleman comes down the street walking his Great Dane in the rain, then hands the reporter the keys to his mercedes and tells him to pay it forward. Disney TV movie about the President's dog that gets mixed up with a mutt. In one scene, the President's pooch is in the kennel. Also in the kennel is a natural ear Harlequin Great Dane. The dogs all "speak" similar to Disney's JOURNEY HOME. The essence of the story is the antagonism between Mr. Darcy (Colin Firth), a wealthy single man who believes Elizabeth (Jennifer Ehle) to be beneath him. In this A&E adaptation Darcy catches a glimpse of Elizabeth playing with a natural ear Harlequin Dane on his estate. A prissy young lady (Goldie Hawn) joins the army. A fawn Dane is seen briefly in a jeep. A new maid (Loretta Young) falls for her employer's wealthy son (Robert Taylor). 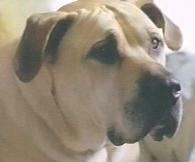 The son has a fawn Great Dane for a pet that is seen several times - including the son's first big entrance. Christina (Greta Garbo) ascends to the Swedish throne. Early in the film she is seen riding into the castle followed by two Danes. Later, the Danes are seen in the castle ascending some stairs. The pair of Danes appear to be fawns or brindles. When college whiz-kids find out that they've been tricked into working on a military project they devise an elaborate scheme of revenge. A fawn Dane is seen a couple of times on campus. A boy discovers his grandfather's parrot once belonged to a notorious pirate and still remembers where the treasure is buried. 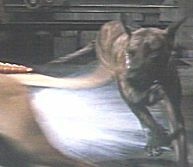 In an early scene, the boy is skateboarding and jumps over a Black Great Dane. A childless couple rents a few orphans on a trial basis but aren't prepared for the big dog, a Fawn Great Dane, that is thrown in as part of the deal. The two Danes portraying Mr. Twixzle are said to be "Chance" (aka Legacy Changes In Attitude owned by Trish) and "Bubba" (aka CH Legacy's Legend In My Time owned by Trish & Carol Elwood). Both dogs bred by Trish Thurow. A runaway boy meets up with a dog and ends up in a mission. 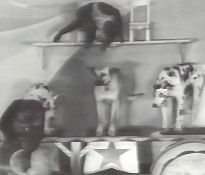 A scene features a dog kennel with a Great Dane appearing.